If folks working in offices in this building of the University of California, Los Angeles (UCLA) have the uncanny feeling that they're being watched — it's probably because they are. After all, those doing the watching are hardly being subtle about it. 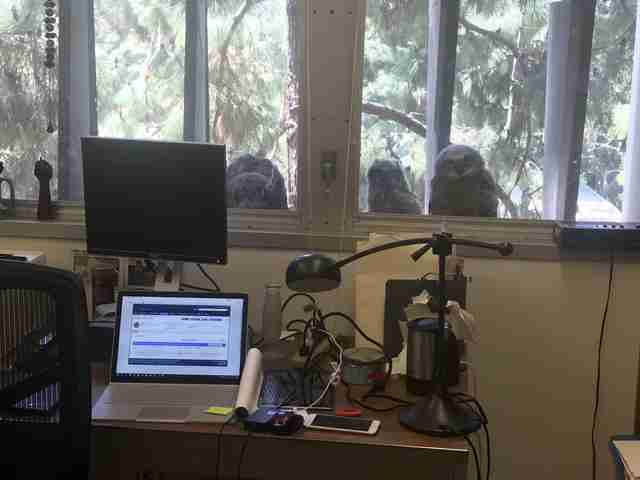 In a tweet this week, Professor Michael Lens introduced the world to a group of baby owls who'd hatched from a nest just outside his colleague's window a few weeks ago. While the chance to get an up-close look at these adorable birds growing up might seem like a wholly positive thing, it comes with one slightly unnerving caveat: They can stare right back. Before long, Lens' tweet went viral — and others started weighing in on the little owls. 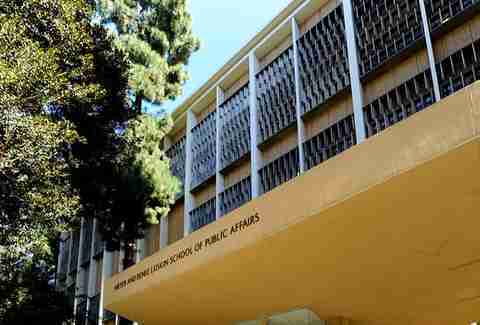 The Dodo reached out to Lens and the Luskin School of Public Affairs to learn more about those little feathered Peeping Toms, but didn't immediately hear back. A post from earlier this year suggests that the birds might be great horned owls. They've nested at this building before. Fortunately, the little owls appear to be doing well there perched on the windowsill, and with any luck, will all live long, happy, fruitful lives as birds of prey. If their ability to intimidate even at this young age is any indicator, they're off to a good start.